A collision and tangle between batter and catcher as the latter attempted to field a bunt up the first base foul line resulted in an umpire's ruling of obstruction, helping Reagan High School defeat Lake Travis in Texas HS playoff action, an interference vs obstruction vs "that's nothing" debate following shortly thereafter. VIDEO: Analysis of the Texas HS OBS play. At any other time, the runner has the right to run along. In other words, the default condition requires the fielder to avoid the runner...unless the fielder is fielding a batted ball. So why, in this case, did the home plate umpire call obstruction on the catcher during such a batted ball? 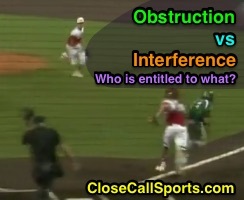 Offensive interference, on the other hand, occurs when the team at bat (in this case, the batter-runner) "interferes with, obstructs, impedes, hinders or confuses any fielder attempting to make a play" (2-21-1a). On a batted ball, a runner is out for interference when (s)he "hinders a fielder on his initial attempt to field a batted ball." So how could this possibly be anything but interference? Answer: Rule 8-4-1g. A batter-runner is called out for interference. umpire shall decide which one is entitled to field the ball and that fielder only is entitled to protection." This means that if both the pitcher and catcher attempt to field a bunt, only one may be protected. In this case (assuming proper rules application), the umpire deemed that the pitcher and not the catcher was the fielder who should be protected. NCAA & OBR: The upper level codes agree—obstruction on this play would require the umpire to have deemed that the pitcher was the one defensive player entitled to field the ball and that the batter-runner's collision with the catcher was the catcher's fault because he, himself, was not protected...but OBR carries with it a heavy helping of handy heedfulness. Rule 6.01(a)(10) Comment disclaims, "When a catcher and batter-runner going to first base have contact when the catcher is fielding the ball, there is generally no violation and nothing should be called...'Obstruction' by a fielder attempting to field a ball should be called only in very flagrant and violent cases because the rules give him the right of way." The NCAA equivalent is 7-11f Exception 4, which states, "If a batter/runner and a catcher fielding the ball make contact, no call shall be made unless either player attempts to alter the play." NFHS is stuck with an interpretation, but no explicit rule, regarding this brand of incidental contact. The rule of thumb here is the closer to home plate the entanglement, the greater the chance that nothing should be called. The farther away from home plate the entanglement occurs, however, the greater chance that someone has committed a violation. So let's say to heck with Rule 6.01(a)(10) Comment—the contact wasn't incidental. In that case, OBR 6.01(a)(10) states, "Any runner is out when—he fails to avoid a fielder who is attempting to field a batted ball, or intentionally interferes with a thrown ball, provided that if two or more fielders attempt to field a batted ball, and the runner comes in contact with one or more of them, the umpire shall determine which fielder is entitled to the benefit of this rule, and shall not declare the runner out for coming in contact with a fielder other than the one the umpire determines to be entitled to field such a ball." If the catcher wasn't protected and obstruction is to be called, this is obstruction type 1, which, during a bunt ground ball, would produce an immediate dead ball (6.01(h)(1)). Penalty: BR gets first base; other runners placed where they would have reached if not for OBS. NCAA is 8-5d ("A runner is out when: The runner interferes intentionally with a throw or thrown ball, or interferes with a fielder who is attempting to field a batted ball") and its approved ruling ("If two fielders attempt to field a batted ball, the umpire shall determine which fielder is more likely to make the play and only that fielder is protected from interference by the runner"). Under NCAA, the ball also is dead and the batter-runner is awarded first base (6-3d-1). Umpire Greg Gibson rules obstruction on F3. Precedent: We saw a similar play in MLB when HP Umpire Greg Gibson called the Athletics for obstruction at Angel Stadium in 2014 after batter-runner Erick Aybar collided with pitcher Dan Otero as Otero and first baseman Brandon Moss as both defensive players simultaneously attempted to field the batted ball. Otero, who had actually fielded the ball, was not the player Gibson ruled obstruction on; that honor went to first baseman Moss, who blocked Aybar's base path and, in doing so, obstructed the runner, who was awarded first base. As a general rule of thumb, when two fielders stand side-by-side to block a runner's base path during a batted ball, one of them is there illegally since a maximum of one fielder may be protected. Mark Carlson no-called this play. As for interference, in 2011, HP Umpire Dan Iassogna ruled Dodgers batter Matt Kemp out for interfering with Angels catcher Hank Conger on a softly-hit ground ball in front of home plate. Two years later, it was Iassogna who ejected Phillies Manager Charlie Manuel for arguing an interference no-call by crewmate Mark Carlson in Philadelphia during a sacrifice bunt play from Rockies batter-runner Clint Barmes. 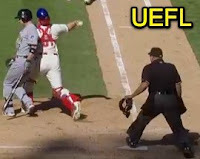 Related Post: MLB Ejection 017: Iassogna/Manuel (4/25/13). The greatest difference between these two plays is the batter-runner's action: Kemp gives up and stands in Conger's way whereas Barmes attempts to run, and is then pushed by catcher Kratz into Kratz's own fielding lane. In Philly, both Barmes and Kratz are "going to first base" when contact occurs. 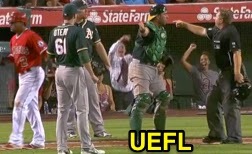 In Anaheim, Kemp is clearly not attempting to run the bases, so he has interfered. The Armbrister tangle/untangle play in 1975. As UEFL Appeals Board member RichMSN then-opined, "Classic Armbrister tangle/untangle." 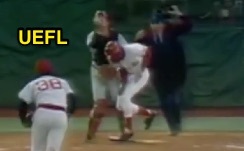 Like Barmes, Reds batter Ed Armbrister moved toward first base when he collided with Red Sox catcher Carlton Fisk in Game 3 of the 1975 World Series, resulting in a no-call from HP Umpire Larry Barnett. You Make the Call: So go back to Reagan & Lake Travis' playoff game, and make a call. Was this obstruction on a catcher not entitled to protection because the pitcher was the player for whom the batted ball was intended, interference on the batter-runner for hindering the protected catcher's ability to field the ball, or is this an Armbrister tangle/untangle? Gil's Call: Whether you're in the obstruction, interference, or nothing camp, I'd like to point out one optical illusion that plagues these types of plays, specifically as it relates to deciding which fielder to protect when more than one fielder pursues a batted ball. Catcher fields the bunt in front of his pitcher. In this particular play, because the catcher altered his path due to the batter-runner—willfully or otherwise—he was delayed in getting to the batted ball. Meanwhile, his pitcher jogged unimpeded toward the ball, appearing to pull up just as the catcher fielded the baseball, giving an odd appearance that the hassled catcher cut-off his own pitcher in his zeal to make up for his collision with the batter-runner. Why did it look like the pitcher was going to get there first if not for the catcher? Because the pitcher, unlike the catcher, wasn't hindered by a batter-runner, so his path to the ball was never altered like the catcher's was. Absent the interaction between catcher and runner, I surmise the catcher would have fielded this ball without the pitcher giving the impression of being "cut-off" by his own teammate.